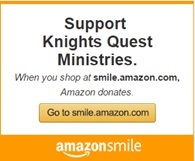 Why did I create BLOGGING THE KNIGHTS’ QUEST? Blogging enables me to be more responsive to events and developments. Blogging is less cumbersome than periodic newsletters. Blogging is how we communicate in the 21st Century. My purpose is to provide timely and relevant information and thoughtful opinions to all who follow me. I’m open for ideas, comments, and critiques. After all, I HAVE been married for nearly 30 years!! !